Many see the Community Shield as just another pre – season friendly. However, it offers much more. There’s determination to win, disappointments if mistakes are made, and high profile players on show. The mind games between one of the best managers in the world and the longest serving premier league manager just added to the occasion. 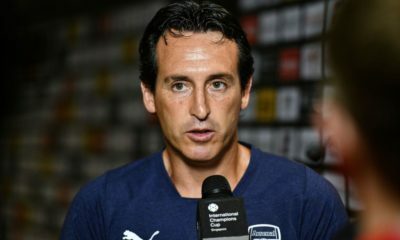 With a cup being on the line, all spectators would be hoping for a high intensity game with both teams having a will to win – Arsenal conveyed this straight from the start. When they didn’t have the ball they hurried to get it back as soon as possible. This was done in a responsible way as well, the press was structured in a specific manner that Chelsea could only play backwards or play forward and inevitably lose the ball. As you can see from the above image, Arsenal’s press is very high and intense. Both central midfielders are pressing, the front three are pressing and the striker is ready to pounce on a ball played back to the defence – in a very tight area. The outcome of this situation is that Arsenal win the ball with ease but fail to create a chance from having the ball. If Arsenal were more clinical when they gained possession of the ball, they would have had a 3vs2 situation with Ozil, Walcott and Ramsey up against Cahill and Terry in the central area. However, credit is due to Willian and Matic who prevented Arsenal to go forward with the ball when they won it. As the game went on and they were 1 – 0 up, they began to have a more disciplined approach. They let Chelsea play with the ball at the back and pressed at the correct times when it was closer to their goal. 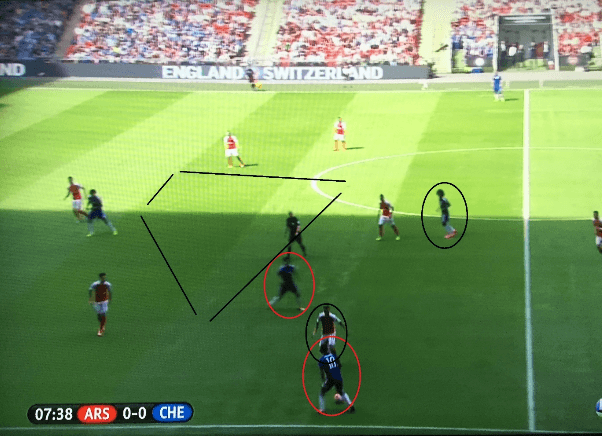 As Chelsea were aiming to play through the lines centrally (more on this further on), Arsenal’s approach was accurate by keeping the line narrow and preventing Chelsea to exploit the space in between the lines of the pitch. 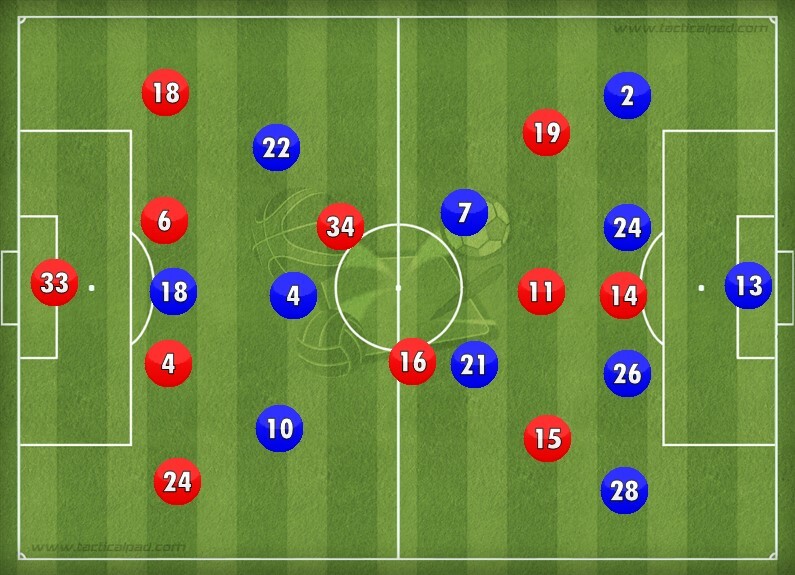 When defending, Arsenal’s 4-2-3-1 attacking shape is transformed into a 4-1- 4 -1 defensive shape. This is an appropriate structure to keep the pitch compact and not allowing any dangerous spaces to appear – if the players concentrate accordingly. 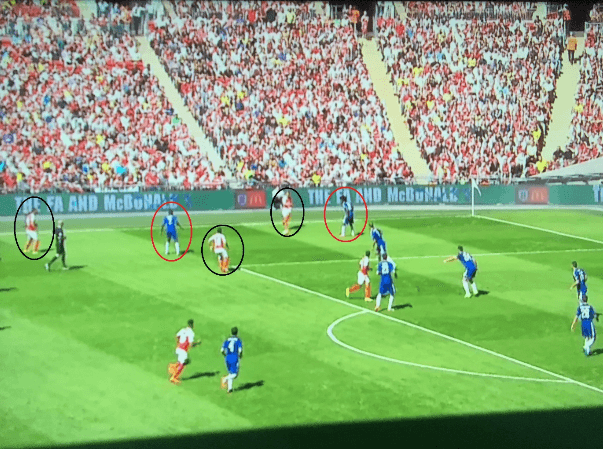 In the above image, you can recognise Coquelin as the central defensive midfielder – the one between the defence and midfield – if Chelsea do aim to play through to one of the front three or the striker in the pocket, it is his job to put pressure on as quickly as possible. A key aspect of his pressing in this situation is his body shape, it will have to be ‘side on’ for two reasons: reason one, the player on the ball will have less amount of space to have a chance on goal, reason two, it allows his midfield team mates to cover his position and follow any midfield runners. From the ways to win the ball back previously discussed, when Arsenal won the ball in those situations they were very direct in their attacks. However, when in possession of the ball they had another method – by using Ozil in the No. 10 position. This was effective at times as the six highest players all have the attributes to keep possession of the ball in tight areas – something Arsenal have been applauded for throughout the years. Cazorla’s movement in this combination is key. When Monreal is on the ball and Willian is preventing him from playing it into the box for a direct run by Cazorla, he has to remain deep, but when the ball is played back to the supporting player and Willian steps up, Cazorla then has the freedom to go higher up the pitch. As we can see from above, Cazorla has moved higher up the pitch and attracted the right back – Ivanovic – to the ball. The arrows in the picture demonstrate a possible outcome when Ozil receives the ball back. Cazorla has done well to move Ivanovic and as we can see Cahill has failed to move accordingly with his defensive line. Yes he is marking Walcott, but he can pass him on to Terry and move across to prevent a possible penetrating pass through the gap. 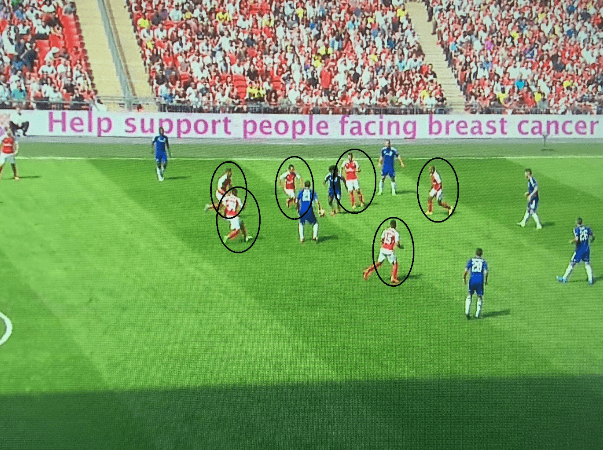 Arsenal’s goal resulted from the deepest player in this structure being the key player but it linked in with one of Chelsea’s weaknesses which will be highlighted later on. Playing against a side of Chelsea’s quality is always difficult, especially when they have the PFA Player of the Year Eden Hazard as one of the attacking three players. As the game started, it was evident how Arsenal were going to deal with Hazard. Young Bellerin had the responsibility of man marking him when he looked dangerous. However, if Chelsea were aware of the situation sooner rather than later they could have punished Arsenal significantly. 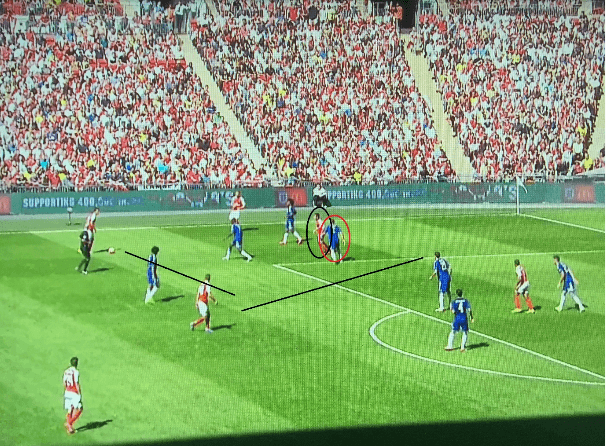 Circled in black is Arsenal’s right back Bellerin, as we can see Hazard has moved inside taking the full back with him. We mostly see this in the defensive third so to see it quite high up the pitch is slightly strange. Where is the danger from this defensive tactic by Arsenal? The space available for Azpilicueta. Arsenal’s right of the three, Oxlade – Chamberlain has failed to track back. As the game moved on, Bellerin followed Hazard all the way to the half way line before the ball was released. As we can see, Azpilicueta has continued his run and is in a terrific position if Remy can do something with the ball. 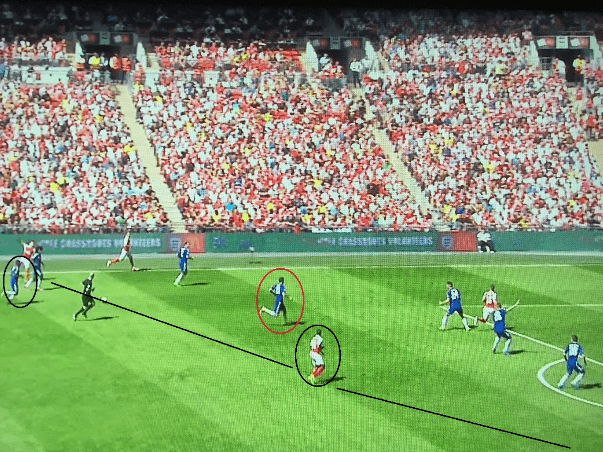 However, he fails to check his shoulder and receive on the ‘half – turn’, if he had done both of the previously mentioned he would notice Azpilicueta and his body will be in the correct position to pass him the ball. 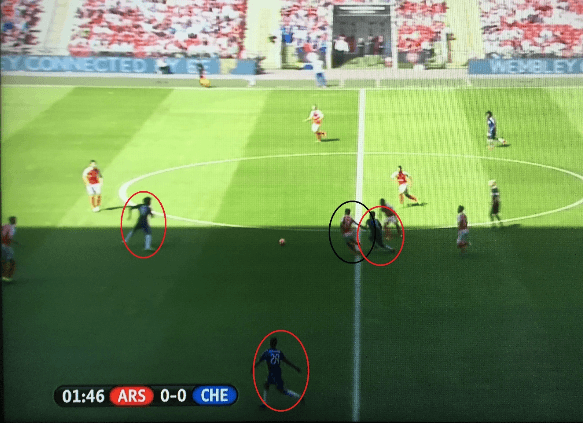 Being clinical is important in counter attacking situations, and Chelsea were nowhere near it here – a possible 3 vs 2 situation could have been created and a potential goal scoring opportunity in the third minute. Throughout the game, Hazard rotated with Willian and Fabregas, meaning it would become too dangerous for Bellerin to follow Hazard, therefore causing the nearest player to him to press hard. Looking at Chelsea’s side closely, how many players do you identify as out and out pacey wingers? Not that many. 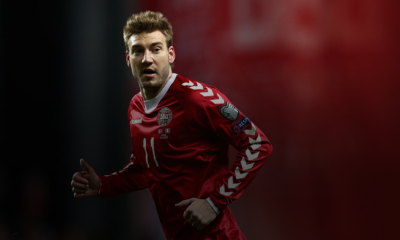 They have players who are technically good and can keep the ball in tight areas – just like Arsenal. However they play slightly differently. Arsenal aim to keep possession tight out wide and get the ball into the box. However, Chelsea like to keep tight possession centrally and aim to either play behind the defence or switch it to one of two high full backs. Looking carefully, Fabregas has moved between the midfield line and defensive line with no Arsenal player close to him. Giving him all the space marked out by the black lines. Ideally, the right of three should drop back and press the ball while the midfield player deals with those trying to move in between the lines. However, we have to take into consideration that this situation occurred when Arsenal were pressing high for the ball. 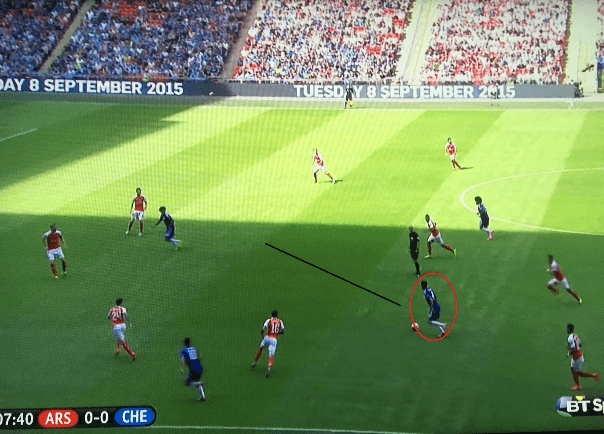 Nobody was marking Fabregas tight, therefore allowing him to turn and run forward with the ball. The space in front of him is dangerous, but he has to faster when running with the ball. He should be encouraged to take bigger touches as there is more space. By moving into this space centrally, if a centre back presses there will be space for Remy and possibly Hazard to run onto a timed pass in behind or if they delay the press there is space to shoot from range. 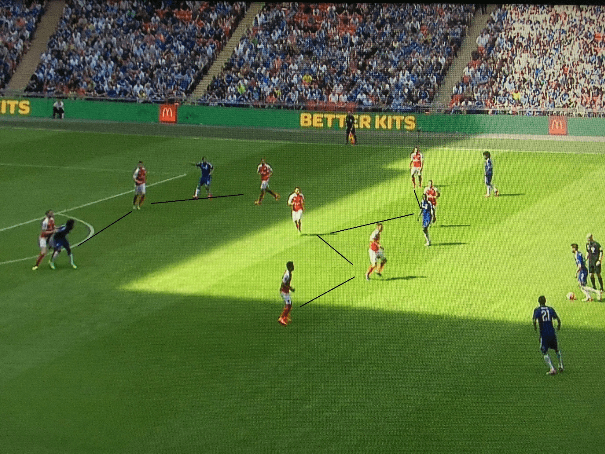 Although this picture has been used previously to identify Arsenal’s defensive structure, it also demonstrates Chelsea’s attacking principle to play through the lines of the pitch centrally. They have six players in the above image, two central midfielders, three behind the striker and the striker himself. One way to play through the lines effectively is through rotation from players high up the pitch. It is clear that when attacking, the front four for Chelsea don’t have a designated position. Fabregas has rotated with Ramires and Hazard has become a second striker. Arsenal have done well though as they are still in a disciplined structure. Two key players not in this image are Azpilicueta and Ivanovic. If they ball cannot be moved through centrally, the full backs are in a good position to cross the ball or drive forward into space as the opponents’ defensive structure becomes narrow and compact in the middle of the pitch. When a player runs past you with the ball or without, it is important you track them. If not, a chance can be created and a goal can possibly be scored. We previously looked at Arsenal’s structure being compact and tight to prevent Chelsea to play through. 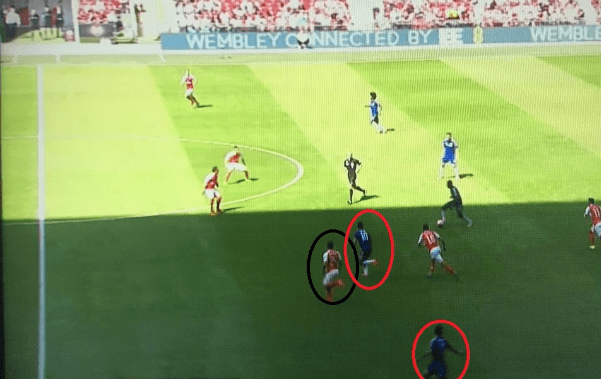 However, what’s good about Arsenal’s combination play down the left hand side is that when running towards the defence out wide, the central players are doing the same. Pictured above is the moment before Arsenal scored their goal. Ozil – the player deeper than the high full back – switches the ball to Walcott who has rotated positions with Ramsey. Have a look at Ramires and Matic, Ramires is running back and so is Matic whose body isn’t in the correct position to try and stop the pass. Walcott soon switches it again to Oxlade – Chamberlain who cuts in and scores a screamer into Courtois’ top right hand corner. Overall, the game was an exciting one with two sides trying to tactically out class their opponent. Arsenal were the successful team in this, therefore regaining the Community Shield. With this now being Arsenal’s third trophy during pre – season I’m sure motivation towards the upcoming season isn’t hard to find within the team and supporting fans. On the back of the signing of Petr Cech, it gives Arsenal a good backbone to what is already a strong team including the likes of Ozil and Sanchez. I would say Arsenal are the team to look out for this season.